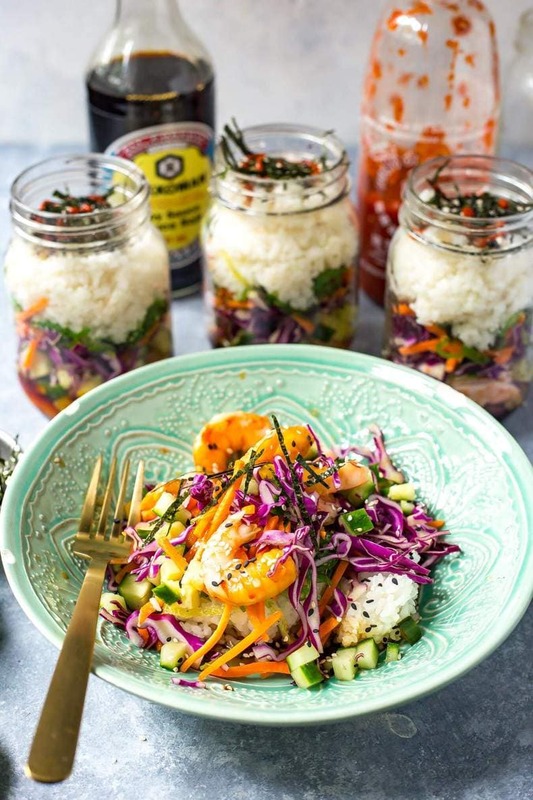 These Dynamite Shrimp Sushi Jars are the perfect grab and go lunch, filled with all the flavours of your favourite sushi roll and seaweed salad! They're also gluten free! Here we are, another day, another jar recipe. This time, it's these Dynamite Shrimp Sushi Jars that I'm kinda obsessed with. 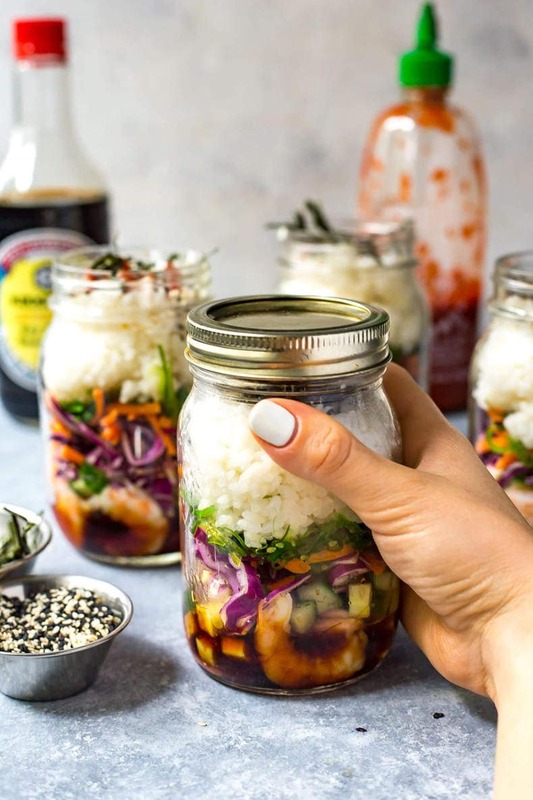 You might ask me why I'm so obsessed with mason jar recipes in general, and I have to tell you that it goes beyond the fact that they bring me good traffic from Pinterest LOL. Aren't I sassy this morning?! 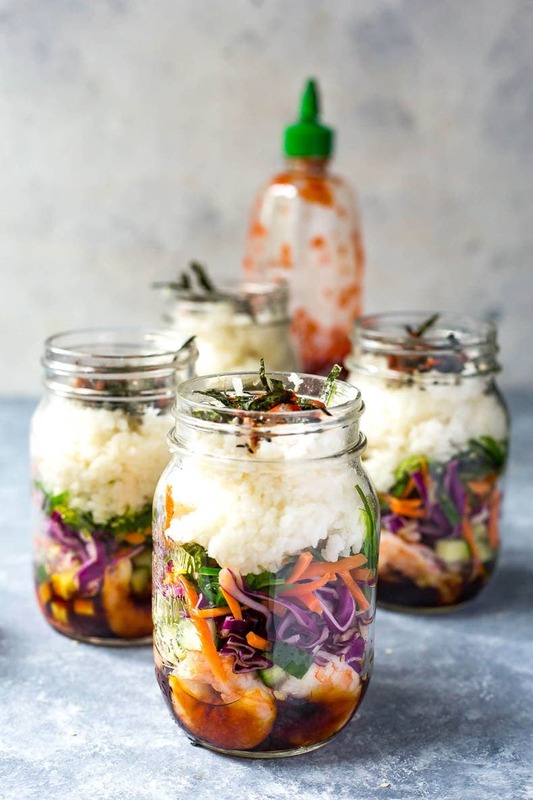 I've long touted mason jars as the perfect transportable container for work lunches (as evidenced with these Chicken Spring Roll Jars and these Sweet Potato Burrito Bowl Jars). First of all, they're super skinny so they fit in your lunch bag and the fridge just right. Honestly, you could have a bazillion of these things kicking around without clogging up the fridge too much. And the shorter ones are stackable too! Second of all, mason jars are ideal for layering your sauces so the important ingredients don't get all soggy. Add in your sauces first, then add your protein, veggies, carbs, toppings and so on. Boom! Lunch for the week ready in a flash! So speaking of organizing and fridge cleaning, I was going through my little shelf and discovering just how many fun, internationally-inspired ingredients I have on hand. Literally everything from red curry paste and fish sauce to pickled ginger, kimchi, salsa Verde and like 5 different types of hot sauce. And YES, I absolutely do need every single different type of hot sauce, thank you very much. Sriracha is so much different from Frank's red hot and the Caribbean pepper sauce I get homemade from my fave little vegetarian restaurant in Toronto that specializes in roti and BBQ tofu bowls. Besides being super stressful (yes, I hate the organization part of cleaning even though it makes me feel so accomplished afterward), this past little fridge clean out has me remembering why I even do this blog in the first place, and it's because I'm a really big foodie at heart who's always looking to switch up my weekly meal prep. Who else is with me on this?! I think it's easy to fall into the trap of making the same thing for lunch every week without even thinking about it. Trust me, as someone who really lives to eat and looks forward to all my meals everyday, I don't think I could just eat the same thing over and over. So, bring me all the creative mason jar ideas and meal prep bowls. 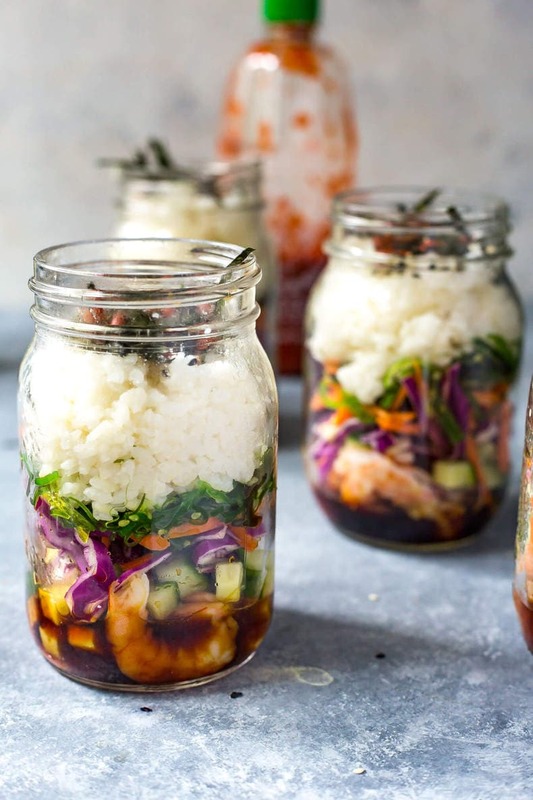 Basically, we've got all sorts of goodies jam-packed into these Dynamite Shrimp Sushi Jars that make assembly super quick and easy. Basically all you have to do is cook the rice, which takes 10-15 minutes top, especially if you have a rice maker. Of course the best part of this recipe is that it's super simple and customizable, so feel free to follow the recipe exactly or add in your own toppings. The list of options goes on and on. Don't be afraid to get creative and add your own twist to it! 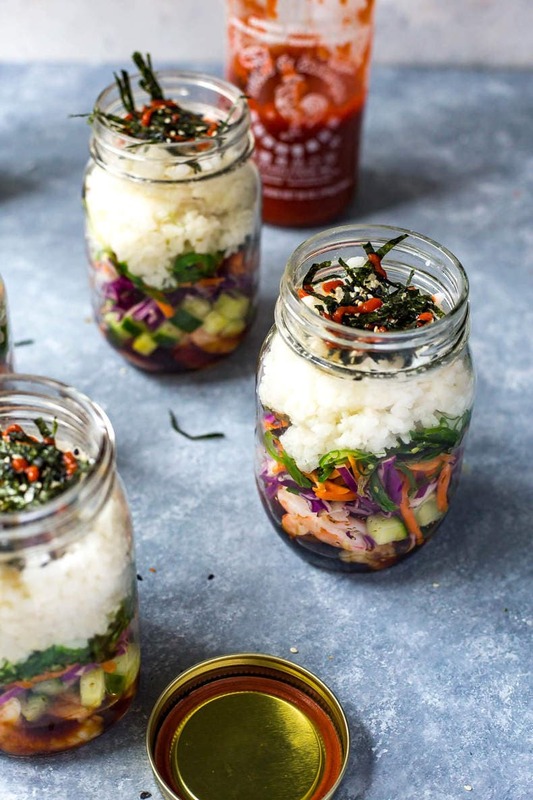 Will you be making these Dynamite Shrimp Sushi Jars? 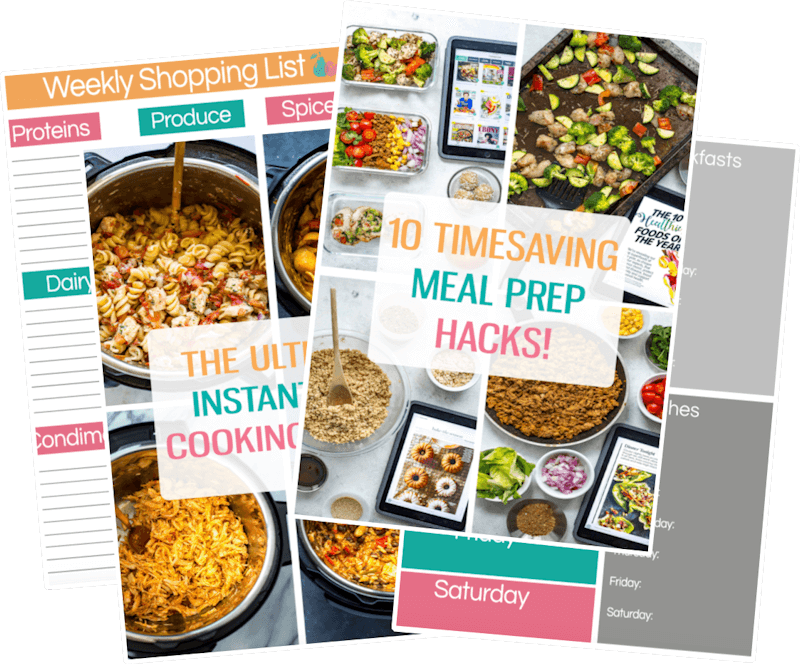 They're so easy to make and put together for the work week, and are literally the most delicious meal prep recipe. 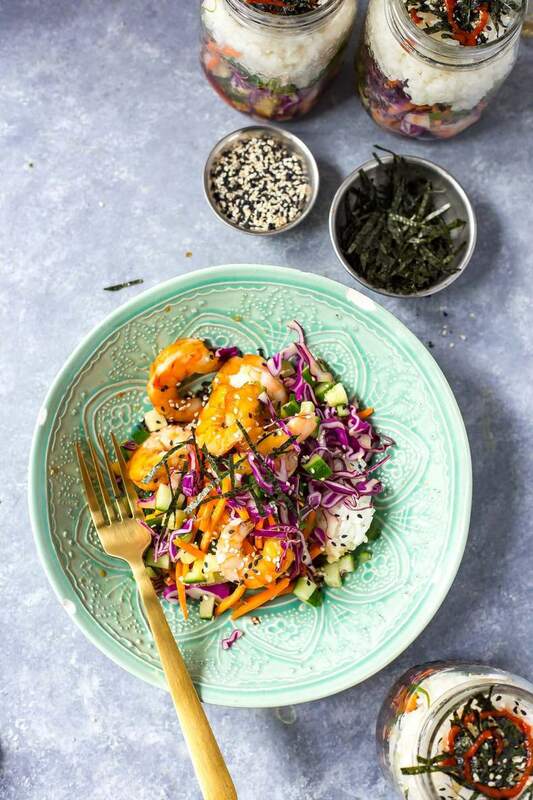 Hopefully they'll also save you a little bit of money – instead of grabbing that dried out, flavourless sushi from the grocery store on your lunch break, you'll have fresh, delicious deconstructed sushi rolls that'll be the envy of the entire office! Cook sticky rice according to package directions on the stovetop or in a rice cooker. When finished cooking, add rice vinegar and sugar, mixing together well. Set aside and let cool. 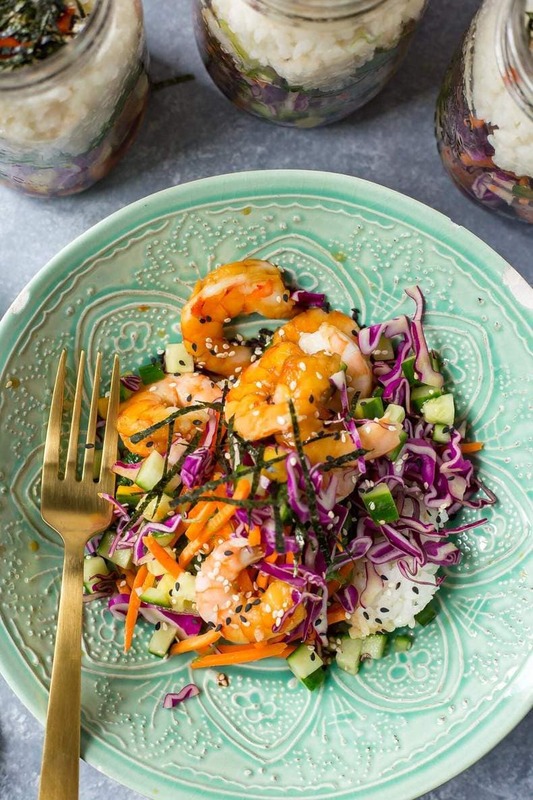 Assemble ingredients and add to jars, layering the following order: soy sauce (to taste), shrimp, cucumber, red cabbage, carrots, seaweed salad, sushi rice, nori strips, sesame seeds and Sriracha. Jars keep in the fridge up to 5 days. To serve, dump into a large bowl and enjoy! Okay! These look AMAZING! 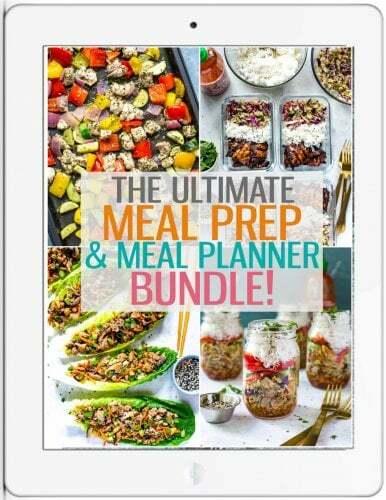 Going to have to make these as part of my weekly meal prep! This looks amazing, will definitely try! What size jar do you use? I usually put in about a tablespoon Tammy!